All Bucephalandra are endemic plants growing only on the island of Borneo. They are grown on river sides in swift waters. Bucephalandra look very similar to Anubias in appearance. The Rhizomes attach firmly onto rocks and wood. The stems of the Bucephalandra are mostly pink or red, and during stress, the Bucephalandra can lose its leaves. Bucephalandra have only recently been in cultivation in aquarium conditions. They firstly appeared in the Japanese aquariums and the trend quickly spread throughout Asia. The price of Bucephalandra are very expensive, but over time will become more affordable. 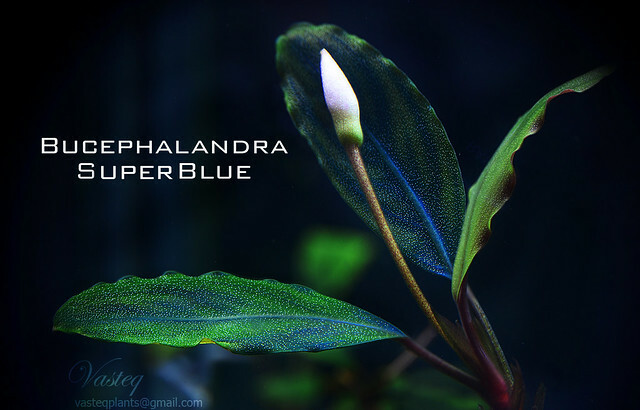 It should be noted that Bucephalandra grow rapidly in nature in high current areas, so in the aquarium we should give him similar environments. Bucephalandra leaves are very colourful. Depending on the species, you would be able to see the colours of the rainbow. Majority of the species have reddish to pink stems, with shiny green leaves. Also depending on the angel you view the leaves, you will also see bright shades of blue, light green, copper, and reddish. Bucephalandra are mainly small to medium size plants, but there is also a large variety over 25cm tall. Bucephalandra are not difficult plants, providing them with good conditions like...strong lighting, a lot of co2 and good fertiliser. If these conditions are met, we can enjoy their fast growth rates and their beautiful colours. When plants are converted to low tech aquariums, newly grown leaves would not be as colourful compared to high tech tanks. Bucephalandra propagation is very similar to the Anubias, when a new growth is formed on the main Rhizome, make sure there are a couple of roots before you can cut and remove. The newly cut growths can be tied on rocks and wood with black cotton until they have take hold of the material. But it is best left to grow together to form clumps.